Greg Prato of Songfacts interviewed Dream Theater frontman James LaBrie. Highlights from interview appear below. Songfacts: How is the new album, Distance Over Time, similar or different to previous Dream Theater albums? James LaBrie: Well, it might be similar to some of the earlier albums in the sense that in a lot of ways, we pulled from our roots. 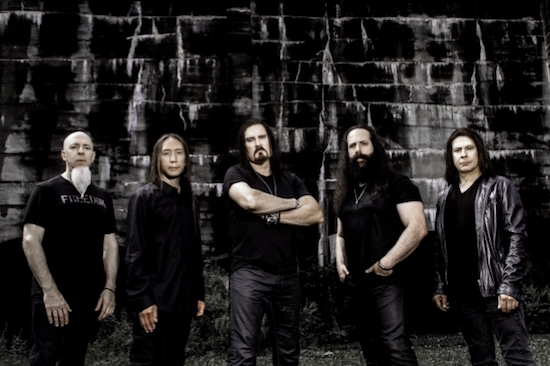 We wanted to connect with how Dream Theater came onto the radar – we were noticed as a very progressive metal band. When Dream Theater came on the scene, “progressive metal” wasn’t even a term. But because we incorporated the metal influence and the progressive, more technical aspects of music, that became a new thing, a new direction musically. It inspired a lot of other bands and still does today. So, when going into Distance Over Time, it was a conscious effort that we wanted to very much incorporate both those elements into this album. We wanted it to predominantly be a more aggressive album for sure, and we wanted it to be more heavy and more metal-based, but at the same time establishing a balance between the two. Not losing our identity or signatures as far as the progressive side of Dream Theater goes. Songfacts: Is it ever difficult fitting lyrics or vocal melodies to Dream Theater songs due to the complexity of the arrangements? LaBrie: No, because while we are composing and arranging a song, it’s always with the thought, “OK, this section is the vocal section. This is the pre-chorus. This is the chorus. This is the bridge.” So, we are always very much aware of what that section is going to represent. The intention is always to write something melodically powerful over top, and the energy of the song has to be something that really lends itself to a strong lyric. Songfacts: What is the hardest Dream Theater song to pull off live? LaBrie: There are several, whether it’s the dynamic or the emotional aspect of it. But if you’re talking about the calisthenics of singing and really pushing one’s limits, I would say Innocence Faded, Take The Time, and Learning To Live. Everything else seems to be in a very comfortable range. I’m talking 25 years, going on 26 years after Images And Words. So, a lot of that material is very difficult, and also the Awake stuff, because that was before I had my vocal injury where I ruptured my vocal cords. Due to that accident, I was compromised a little bit as a singer in the sense of range. Before the accident, my range was ridiculous. I could sing from the moment I woke up until the moment I went to sleep. Since then, I have to be very careful and a little of my range was compromised. Some of those songs are notes in the stratosphere. I had to alter the melodies to fit who the singer is today. Songfacts: Who are some of your favorite singers? LaBrie: Right off the bat, Freddie Mercury is my all-time favorite. Steve Perry, Lou Gramm, Rob Halford, Steven Tyler, Robert Plant definitely, Ian Gillan, Glenn Hughes, Rod Stewart, Nat King Cole, Conor Mason from Nothing But Thieves, Sameer Gadhia from Young The Giant, and Paul Meany from Mutemath. I love Ryan Tedder from OneRepublic – I think he has a beautiful voice. Jeff Buckley is another one. I believe Jeff Buckley is an influence on Conor Mason. Songfacts: Looking back, which Dream Theater album are you most proud of? LaBrie: This one [Distance Over Time] is a big runner-up, but Images And Words is always going to be my choice, because that established what Dream Theater really is. I think it’s a phenomenal album from beginning to end. When I look back at that time, when that album came out, we stuck out like a sore thumb, but thanks to Derek Oliver [A&R man], Atlantic got behind this. Grunge was the big thing, and then we come out with an album like Images And Words… people must have been looking at us like we had two heads. And then, for that to be successful, that really paved the way for the rest of our tour, and has created the longevity of who and what we are. But I’m also extremely fond of The Astonishing, which I know is a very controversial album. And the reason I say that is for me personally as a vocalist, it really allowed me to show every single facet of who and what I am as a singer. So, that album, even though it polarized our fans – there’s no doubt about that – to me, as an artist, it really was absolutely fulfilling and gratifying. I really wish Mike Portnoy would rejoin Dream Theater. Mangini is a great drummer, but Portnoy was one of the heartbeats of that band.